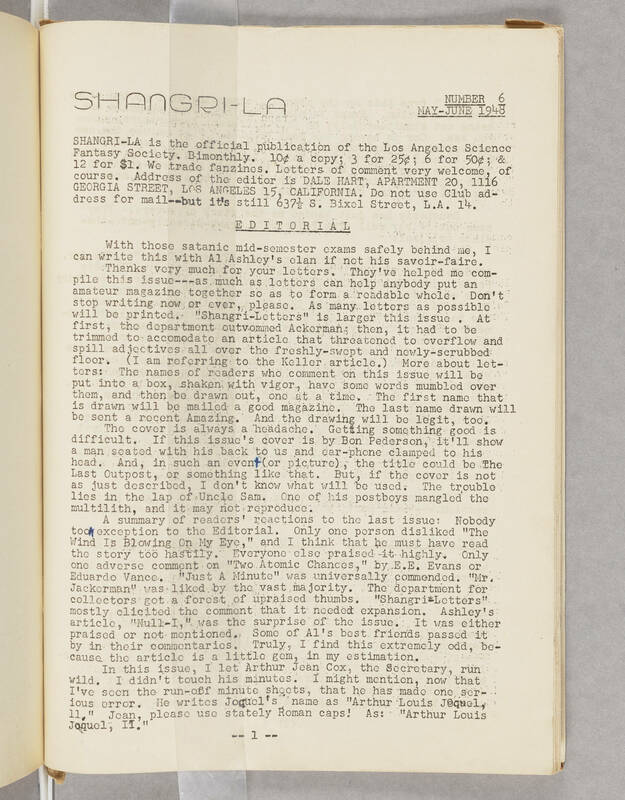 SHANGRI-LA is the official publication of the Los Angeles Science Fantasy Society. Bimonthly. 10 cents a copy; 3 for 25 cents; 6 for 50 cents; & 12 for 1 dólar. We trade fanzinos. Lotters of comment very welcome, of course. Address of the editor is DALE HART, APARTMENT 20, 1116 GEORGIA STREET, LOS ANGELES 15, CALIFORNIA. Do not use Club address for mail-- but it's still 637 S. Bixel Street, L.A. 14 EDITORIAL With those satanic mid-somester oxams safely behind me, I can write this with Al Ashley's Olan if not this savoir-faire. Thenks very much for your letters. They've helped me comamateur magazine together so as to form a readable whole.